If you are looking for a small cup for teens, click here. If you are looking for a shorty cup, click here. For menstrual cup FAQ’s, click here. 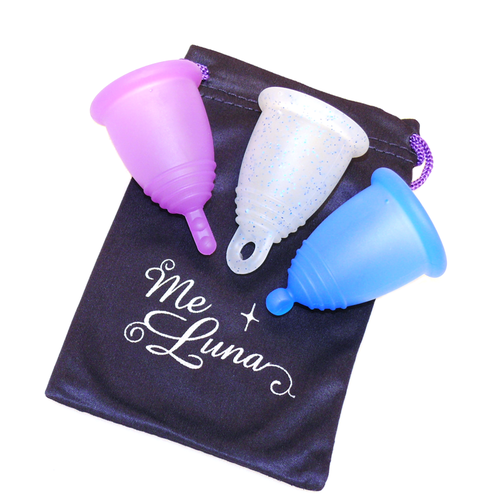 MeLuna Menstrual cups are an eco-friendly, practical and inexpensive way to deal with your period. MeLuna Menstrual cups are designed and manufactured in Germany to the highest standards and come in a very wide variety of styles and colours to suit your individual needs. Choosing the correct Meluna cup for you: (If in doubt, please contact us and we will help you select the appropriate size and style). 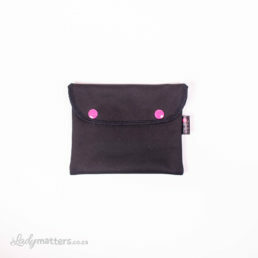 Small – One if the smallest menstrual cups available worldwide. Suitable for slim, petite, women who have never had vaginal births. Light menstrual flow with very strong pelvic floor muscles. A great starter cup for teens. 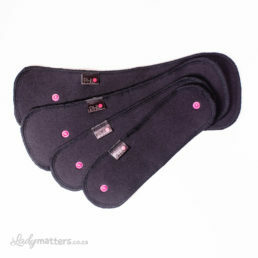 Medium – Still one of the smaller cups available on the market, it is suitable for women with a medium build, regular flow and normal pelvic floor muscles. Large – Suitable for women who have had vaginal births, also women with normal to strong physique and heavy flow. This size can also work for very tall, slender women with heavy flow. Extra Large – Suitable for women who have had vaginal births, with a normal to strong build and very heavy menstrual flow. If the length is not a problem, this cup can also be suitable for women with weakened pelvic floor muscles. Soft – The material feels very soft and can be compressed easily. This also means that it might be more difficult to get this cup to pop open amd it is recommended for more experienced cup users. This cup is perfect for women with weak pelvic floor muscles, or who are sensitive to pressure, for who tampons can feel uncomfortable. Classic – The firmness level of this cup is normal and is suitable for most women. If it very comfortable and should provide a good fit for women with normal pelvic floor muscles. Sport – This is a firm cup well suited to women who are very active and have strong and well developed pelvic-floor muscles. We buy our raw material from the manufacturer, Kraiburg GmbH Waldkraiburg. 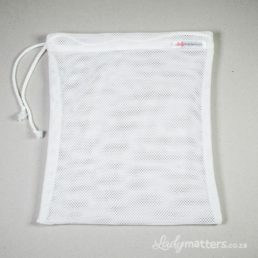 This particular TPE was developed especially for highly sensitive products, and has passed the mucosal irritation test. It is used in environments such as hospitals and pediatric clinics which require a high degree of sterilization, and is approved for use in the medical field. The material is produced in Germany. Among other things, the Me Luna® material is also used to make teats for baby bottles. Because of the high regulatory requirements for baby products in Germany, you can be assured that Me Luna® is made with top quality materials. I have been using another cup for some months now and was keen to try out a larger and softer one. I bought the MeLuna cup in the extra large size and softest version. I also decided after some umming and ahhing to try out the version with the ring rather than a stem or ball on the end. I have been delighted with the MeLuna Cup. It holds twice as much as my previous cup so is ideal for heavier days and while I did find it a little big compared to my first cup I easily grew used to it once I had mastered insertion. I find it easier to remove than my previous cup and cleans easily too. I readily recommend this cup to anyone. I really love my Meluna cup. I have another cup that is very soft and I struggled to open it but my Meluna is so great it pops open on the very first try. I consider myself to be a newbie after using a cup for only 2 months but already the Meluna has made me a pro! I went for the XL because I needed a large capacity and Meluna cups offer this. They have a large range to choose from. Size, colour, firmness etc! I also have a high cervix and I can’t feel the XL at all. I have a ring stem that I don’t feel at all either, it’s very easy to grab hold of and remove. I will be getting one for my daughter! Yay for Meluna cups! I have been using my XL MeLuna cup with ring stem for 5 years now and I am about to order a replacement. I could not imagine life without it. It has made it possible for me to have a better night’s sleep and cope much better on my heavier days. I can highly recommend it.